Chugging upstream from Lake Pepin in 1854, the Grand Excursions travellers would have encountered a small settlement of pioneer entrepreneurs at the foot of a massive bluff. Now known as Red Wing, Minn., the town was created by the river, named after a Dakota chief and made famous by, oddly enough, clay and boots. Located on the site of a former Dakota village, Red Wing (pop. 16,116) is named after a succession of Dakota chiefs who all carried the moniker and a swans wing dyed red. Trenton Island sits directly across from downtown. During Prohibition, it was the place in Red Wing to find speakeasies and prostitutes. Today, the island is a quiet wooded spot, still home to a couple of bars, marinas and a few recreational cottages. Clay dug from local pits was formed into the famous crocks, jugs and dishes of the Red Wing Stoneware Co., now prized by antique collectors nationwide. The company began in 1878 and operated until 1967. Today, shoppers explore the old brick building that was the pottery factory, now a shopping center called Pottery Place. A grandson of the last company president, Scott Gillmer, currently operates Red Wing Potteries Inc. near the site of the old factory. For the last 99 years, workboots and shoes have been manufactured in Red Wing. The Red Wing Shoe Co., the citys second largest employer, is headquartered downtown and owns many of the historic buildings there. Several parks in Red Wing bring visitors to the riverfront. Colvill Park (locals pronounce it Cuh-vull) and Bay Point Park are great places to spend a lazy afternoon by the river under the shade of a cottonwood tree watching the parade of pleasure boats and commercial tow traffic. Downtown, visitors can take a picnic lunch and watch the towboat pilots negotiate the sharp riverbend passing at Levee Park. For solitude, try Barn Bluff, the huge limestone dome that punctuates the shore of the river just downstream from the bridge. Hikers who climb the steep trail to the top are rewarded with a view of Lake Pepin. One end of the Cannon Valley Trail is upstream from downtown. The 20-mile, paved trail follows the Cannon River to Cannon Falls. Above Trenton Island, a single channel winds up to Lock and Dam 3. The Wisconsin side of the river is undeveloped for ten miles beyond the tiny village of Diamond Bluff (pop. 479) and characterized by high, rugged, stone bluffs. Prairie Island is bound by the sloughs and backwater lakes of the Vermillion River on the west, and by Sturgeon Lake, a wide spot in the Mississippi, on the east. The island is home to two uneasy neighbors  the Prairie Island Mdewakanton Dakota reservation and the Prairie Island Nuclear Power Plant. The tribe operates a large hotel, casino and marina and is the areas largest employer, hosting about 2,000 jobs. The Wisconsin shore of the Mississippi ends at Prescott (pop. 3,764) at the mouth of the St. Croix River. Organized in 1839, the town was named after Indian agent Philander Prescott, an early speculator who believed that the towns situation at the junction of the two major rivers would ensure its development into a major city. Instead, Prescott is a major center for recreational boating for both rivers. Take in the spectacular view of the joining of the rivers from the blufftop at Freedom Park in Prescott. Hastings, Minn., (pop. 18,204), just upstream from the mouth of the St. Croix, was incorporated in 1855. The city takes its name from Henry Hastings Sibley, one of the early promoters of the town and later governor of Minnesota. The city has a wealth of historic architecture, although its most famous landmark, the Spiral Bridge over the Mississippi, was demolished in 1951. The downtown riverfront is in the planning stages of redevelopment, and a new park known as the Riverflats has been established just north of downtown on the riverbank, with a trail that connects to the downtown and 15 miles of city trails. 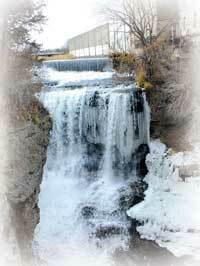 Vermillion Falls Park offers lovely views of the falls of the Vermillion River. A flour mill operates at the site, a modern cousin to the mill making the first graham flour here when the Grand Excursion passed in 1854. Ignatius Donnelly, writer, farmer and pugnacious politician cofounded the town of Nininger just upstream from Hastings in 1856. It was advertised as a utopian community, and peaked at 200 residents in 1858. The Nininger post office closed after 1885, and no sign of the town exists today. Just northwest of the city, Spring Lake Park Reserve offers miles of trails and a fabulous view of the river from the Schaars Bluff picnic area.